The correct spelling of this name is CATERINA SFORZA. 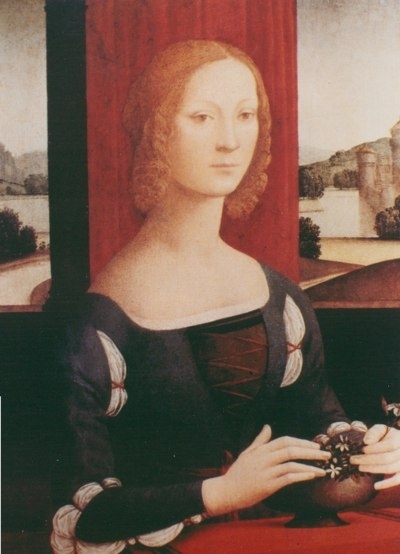 Caterina Forza, the illegitimate daughter of the duke of Milan, was betrothed at the age of ten to Girolamo Riario, a nephew of Pope Sixtus IV. By 1480, Girolamo and Caterina were the count and countess of Forlì and Imola, in north-central Italy. Girolamo acquired many political enemies and was assassinated in 1488. Rather than cede her lands to Girolamo’s killers, Caterina occupied the fortress of Forlì, subdued enemy troops, and ruled as regent for her son Ottaviano until 1499. Her regency was turbulent; she was both a brutal tyrant and a courageous warrior. Critics and admirers agree, however, that she was a brilliant military strategist. Caterina’s downfall came in 1499, when Cesare Borgia attacked her lands with the help of French troops. After an audacious defense of Forlì, she surrendered to Borgia and was imprisoned in Rome for a year. Upon her release, she retired to the Annalena convent in Florence.